All week, Harry Styles has been joining James Corden on the Late Late Show. The singer has been juggling, performing hilarious skits about singing, and even taking over the opening monologue (complete with some rather epic dad jokes). To close off his residency, Harry Styles joined James Corden on his journey into work for one EPIC Carpool Karaoke. After completing “Sign of the Times,” Harry revealed that the track actually makes him a bit emotional, and that he’s cried “in a cool way” after performing the song live. James also compliments the singer on his effortless style, with the pair switching outfits (Harry even ends up wearing a skintight, gold lamé shirt and string vest!). Things really heat up, however, when Harry Styles and James Corden decide to recreate some famous scenes from romantic movies. As we know, Harry is a HUGE fan of rom-coms, but we didn’t expect him to be *this* good at it. He expertly does Julia Roberts’s role in Notting Hill, and the pair even do Kate Winslet’s “draw me like one of your French girls” scene from Titanic. 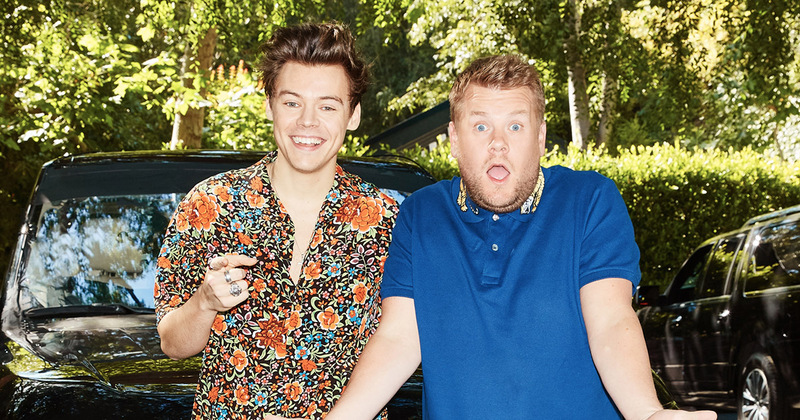 Watch Harry Styles and James Corden’s incredible and hilarious Carpool Karaoke below. Omg! After watching this, we’re convinced that Harry needs to do a romantic comedy (hey, he is an actor now). We can picture it already. He could even provide the soundtrack. Meanwhile, Harry Styles’ self-titled debut album is out now.